NGC 40 (Caldwell 2) is also known as the Bow Tie Nebula in Cepheus at RA 0hr 13min 29s and DEC +72deg 31min 21s. North is up and the field is ~40′ square. It is a planetary nebula about 1 light year across that was discovered by W. Herschel in 1788. It is oval in shape and has bipolar lobes extending beyond the oval core most likely representing an early expulsive event. Chandra data indicate that the central portion of the nebula shown above has" multimillion degree hot gas that has been heated by a 2 million miles per hour stellar wind from the dying star.". The red curtain to the north gives rise to the name "Bow Tie" Nebula. There is some faint background nebulosity below NGC 40 that is better seen when the main image is expanded. Data were taken automatically with CCDAutoPilot4 running MaximDL4.62 and PinPointPro for image linking. The system was guided with an SBIG ST-402 on an Astrodon MonsterMOAG off-axis guider. 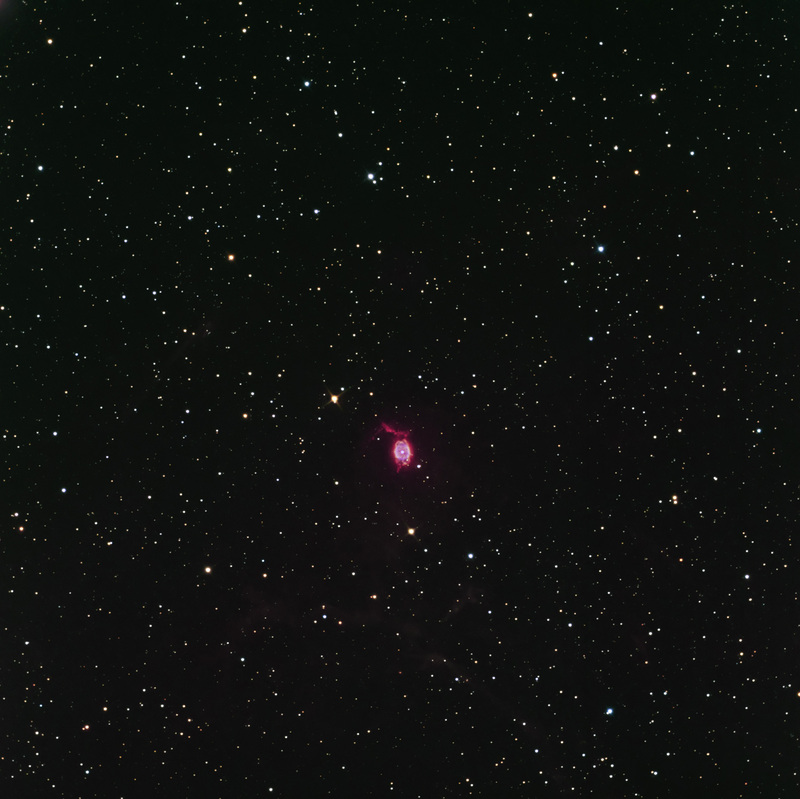 Astrodon Generation 2 E-Series LRGB and 3nm H-a, SII andOIII narrowband filters were used. Data were calibrated in CCDStack and further processed in Photoshop CS3.